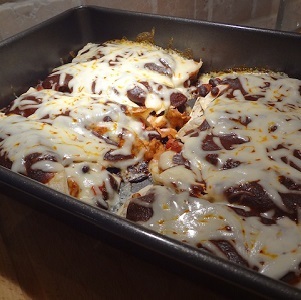 Delicious chicken enchiladas with a wonderful red mole sauce. Mole sauce gives a nice extra bite of heat. Very easy and tasty! Wish I had experimented with mole sauce sooner. In each tortilla add chicken mixture and sprinkle with small amount of Monterey cheese. Roll up the tortilla and place in baking dish. Enjoy with your favorite Mexican rice!